In which Claire, who doesn’t speak french, bakes her way through the cake section of a 1962 French cookbook. “L’intérieur du gateau doit rester moelleux.” Says my cook book. Oh yes, say I, the interior of the cake should stay soft! Moelleux is a nice word, isn’t it? A soft word. A melty word. I love melty things! I love when the snow melts in the springtime, ice dripping from branch tips and releasing the buds from their frosty casing. I love ice cream mostly because it melts. It’s such a pleasant anxiety to eat it before it’s a puddle – to savor each spoonful or lick of the cone when it’s just the right creamy softness, before it’s just cream. It’s about time passing! Add hot fudge and you have the frisson of warm and cold, you have the changing of seasons. I like butter melting on toast, cheese melting into warm bread, secret melted cheese or chocolate hidden inside of things, a chocolate-covered cookie melting in tea. I love the melty feeling you get inside when you’re happy, when you feel love for something. I like the scene in Amelie when she melts – she turns into water and melts away into a puddle. Amelie, of course, is french and very sweet, and so is this cake! It is delicious! 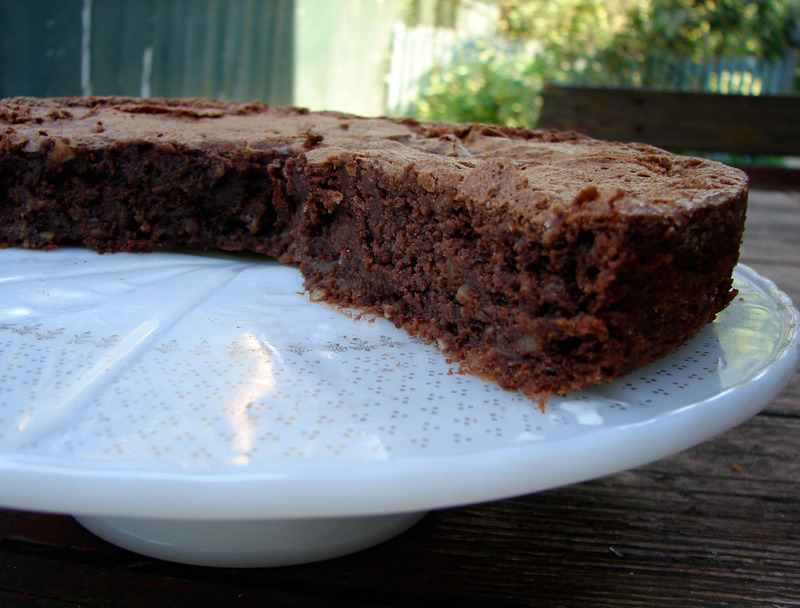 It’s crispy on the outside, soft in the middle (as it should be), chocolatey, a little crunchy because of the almonds. It’s somewhat similar to the cake I made last week, in that it’s flourless and chocolate, but it’s denser, and last week’s cake had quite a lot of cornstarch in it, and this has much less. The recipe didn’t specify an amount of butter – I think it must be a misprint. This being a french cake, I decided to add a whole stick (1/2 cup)! And I decided to add salted butter, because the recipe doesn’t call for salt, and I like a pinch of salt in my baked goods. Here’s Nouvelle Vague with I’ll Melt with You. Melt the chocolate chips in a double boiler. (Or in a small saucepan over a bigger saucepan with boiling water in it, if you don’t have a proper double boiler.) Stir in the milk as it’s melting. Add the butter and stir that till it’s melted, too. When it’s all nicely melted, pour it into a big bowl. Beat in the sugar, and leave it to cool for a few moments while you prepare the cake pan. Butter and flour an 8 or 9 inch cake pan. I put a square of tinfoil in the bottom and butter and flour that, too, to make it easier to get the cake out at the end. Beat the egg whites till they’re stiff. By this time, the melted chocolate mixture should be somewhat cooled. Stir in the vanilla, and then stir in the egg yolks. Add the almonds and corn starch, and beat until everything is very smooth. Fold in the egg whites. Pour the batter into your prepared pan, and bake for about 35 minutes. The top will be lightly crusted, and the edges will be firm, but the center will still be a bit soft. Let the cake cool before you take it from the pan. This entry was posted in cake, chocolate, dessert and tagged chocolate cake, flourless chocolate cake, french cake a week, gateau chipolata, gluten-free cake by Claire. Bookmark the permalink. I like the “French Cake Series”! Great idea! Looking forward to seeing the next recipe! I do smth similar but a more diet-like version without starch and milk. With cocoa powder instead. It turns “moelleux à l’interieur” as well. It’s quick to make and super delicious! That sounds delicious! Does it have melted chocolate in it as well? The cocoa powder certainly has more flavor than cornstarch!